The problem with “news” is that by the time you are done searching for the articles that you want to read, it becomes “olds”! Now with all that computing muscles and algorithmic smarts in the world, someone had to come up with a news service that learns your reading behavior and suggests relevant articles. Sense is that application with a cutting edge recommendation engine and a beautiful user interface: it is exactly what the doctor ordered for the chronic news addict! Marcin Benesz is the CEO and founder of Sense. He has background in resolving math problems and worked in General Electric predicting jet engines reliability. He has also worked in MTV as a software engineer. Helping him with Sense are co-founders Mariusz Domański, the head of software development, and Adam Markiewicz who heads business development. The team consists of a few other dedicated members as well. “Sense is like an online newspaper prepared just for you with all the news and articles tailored to your interest. In Sense you find articles that you truly care about”, is how Marcin describes his company. He is an ardent consumer of online content like articles, videos and music. His maths and computer science disposition compelled him to find a solution to improve the searching time involved in getting to the content. The company has been bootstrapping for a year and getting funded is proving to be difficult. But the company is hopeful in attracting both financial backing and fresh talents in the team. More than just finding the relevant contents, one has to ensure that a news recommendation engine is finding credible contents. “There are a lot of competitive advantages that we are building in our recommendation system. To mention few: better accuracy, simplicity for the user, increased transparency and more privacy. I believe that this is the way to provide better, more engaging and democratized (less popular but still good quality) content”. says Marcin. Its closest competitor is Flipboard which markets itself as a personalized magazine. But Marcin is convinced that Sense can take them on, “They have bigger budgets, but we can act quicker and stay more innovative. Our advantage is that we have new fresh approach from technical side and also design perspective”. 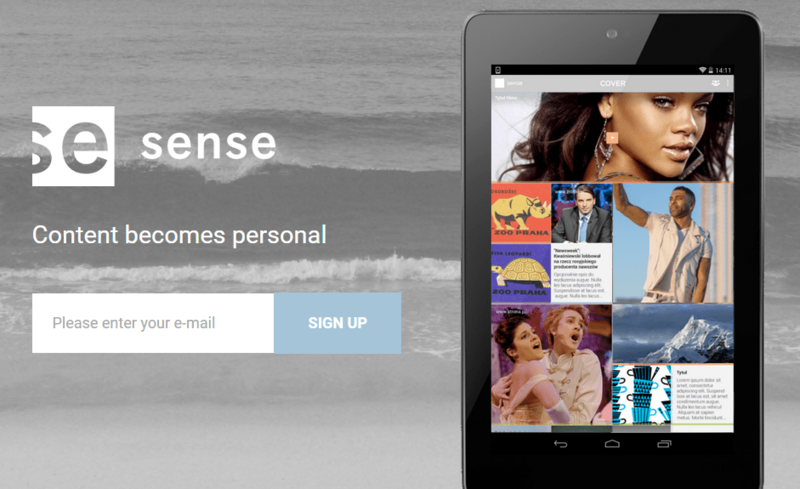 Another advantage over Flipboard is that Sense has a version for business users as well that will be implemented in the following months. This spirit of fearlessly taking on the Big Boys is admirable and gets a thumbs-up from Startup Dope! Marcin is planning to take Sense global but they want to target US and UK markets first. They have been presenting themselves on international conferences like Investor Day of Central and Eastern Europe, Belgrade Venture Forum. They will attend conferences in the US this year as well. Since they follow both B2C and B2B model, their target audience is varied from blog readers that subscribe to multiple RSS feeds to bloggers and content providers who want to increase customers engagement and loyalty. They plan to introduce subscription based premium accounts for both consumers and business clients. Premium features will include a physical personalized newspaper and content marketing. Previous articleSummarize The World In 100 Words Or Less With AbridgeMe!